A Day In The Life Of A Machine Learning Engineer on YouTube. I started learning at the tip of the iceberg. Now I’m going back to basics. Is a wealth of data the final frontier? Part I: A new beginning. Part II: Learning Python on the fly. Part III: Too much breadth, not enough depth. A lot has happened since Part III. While the last couple of articles went in-depth into what exactly I was learning, this one will be a little different. Rather than break it down week by week, I’ll cover the major milestones. I graduated from the Udacity Deep Learning Nanodegree (DLND) in August last year. Thinking about how I emailed the support team asking what the refund policy was before starting the course makes me laugh. It was easily one of the best learning programs I’ve ever taken. If you’re after more details, I recently published an in-depth review video on the DLND. Making videos about my journey has led to some great conversations with others on the same path. I met someone in Canada who was doing almost the exact same courses as me. Even more interesting is that we have the same poster of Arnold in our room. Small world. More recently, I had the opportunity to have a conversation with Shaik Asad, a 14-year-old AI developer from India. He teaches himself AI after completing his homework. Since then we’ve been actively chatting about life and our other interests. Seeing how passionate Shaik is about AI and hearing what his goals are, inspired is an understatement. After graduating from the DLND, I was a deer in the headlights. I’d learned all about the amazing power of deep learning (DL) but still didn’t fully understand what really made deep neural nets tick. I was also left wondering whether DL is the be all and end all of Artificial Intelligence (more on this later). I needed to know more. Curiosity led me to create my own AI Master’s Degree. Having a rough outline of a curriculum to follow allowed me to narrow down how I would spend my time. My mission is to use AI to help people move more and eat better. I have skin in the game in the world of fitness and nutrition, I’m working on the AI side. 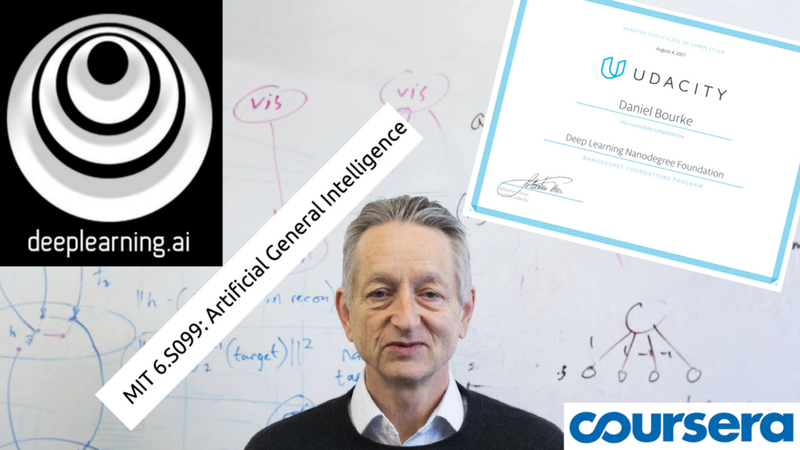 In the past few months, I’ve completed 80% of the Coursera Deep Learning specialisation (course 5 was just released as of writing) by Andrew Ng and the team at deeplearning.ai as well as Term 1 of the Udacity Artificial Intelligence Nanodegree (AIND). For those who learn from a ground-up approach, the deeplearning.ai specialisation is the best place to start learning about DL. If you’re more into diving into project building, or want to progress with one of Udacity’s advanced Nanodegrees, start with the DLND. Term 1 of the AIND covered classical AI approaches. It lost me at times due to my lack of programming ability and my recent focus on DL. However, learning about how far the field has come since inception was fascinating. 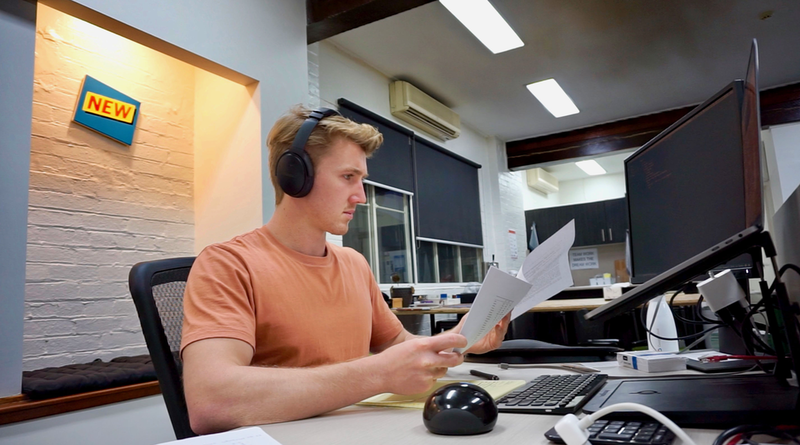 I’m into Term 2 now, which includes building projects in computer vision, natural language processing and speech recognition using DL. Back in a familiar fishbowl. I’ll release a full in-depth review of the deeplearning.ai and AIND once I’ve completed them both. After learning more about how DL works, I started to become suspicious of what its longevity prospects are. Many DL models need a ridiculous amount of data to produce a useful output. This is well and good if you’re one of the two companies in the world with enough data to keep Titanic afloat but not so good if you’re a young AI hopeful. Deep Learning has brought about many incredible insights but many of which are in the realm of supervised learning, which still takes a lot of human input. Although our ability to gather and produce data is increasing exponentially, I’m not convinced more data is the key to solving all of our AI problems. Are we really just data-processing machines? Last century, people thought our internal processes could be modelled using the concept of steam engines. The man with a hammer problem comes to mind. Back-propagation (an algorithm to help neural networks improve themselves) does not work very well on unlabelled data, which is what most of the universe is comprised of. Consider a four-year-old walking into a room they’ve never been in. The young child doesn’t require 10,000 labelled images of a room to know how to navigate it. They don’t even require one labelled image of a room, they simply start interacting with it. Even the godfather of Deep Learning seems to be thinking along the same lines. In an interview late last year, Geoffrey Hinton was asked his opinion on the current state of AI techniques. Listening to the lectures and talks of Monica Anderson (especially the one on dual-process theory) and discovering her work on Artificial Intuition as an approach to Artificial Intelligence raises more questions on the matter. I will delve deeper into these topics in a future post. Over the next few months, I will be completing the curriculum I have set out for myself. I just submitted the first major project of Term 2 of the AIND, a computer vision model to detect facial keypoints. For each of the upcoming major projects, I will be posting an article detailing my understanding of the work as well as a step-by-step guide for those looking to build an equivalent. I’m also thoroughly enjoying the free courses on offer from MIT on Artificial General Intelligence and Deep-Learning for Self-Driving Cars. After completing the AIND, fast.ai seems likely to be my next port of call. By the time I finish up my curriculum, I will be looking to move to the US to join a startup in the world of health and AI (or create my own). If you know anyone or think I should be following anyone currently playing at the crossroads of health and AI, please let me know. For those considering embarking on their own self-led learning journey or finding out more about AI, the words of Naval Ravikant sum it up perfectly. The current education system is a path depended outcome. We have the internet now, if you actually have a desire to learn, everything is on the internet. The ability, means and tools to learn are abundant and infinite, it’s the desire to learn that’s incredibly scarce. See you in Part V.
Part 3 of my How I'm Learning Deep Learning series. This whole about AI and Machine Learning fascinates me. I decided to get involved. Here's how.